We are engaged in exporting and supplying of industrial valves spring that are renowned for their durability, temperature and pressure resistance. Our range of valves spring finds applications in various industries such as automotive, engineering, generators and diesel engines. We can provide the industrial valve spring of all following models also. KOMATSU Engine Spares Model Nos: 4D95, 6D95, 6D102, 6D105, 6D125, 6D155, 6D170, 4D170. 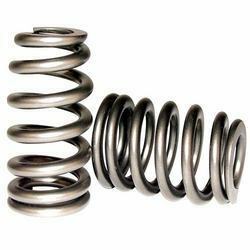 Looking for Industrial Valve Spring ?